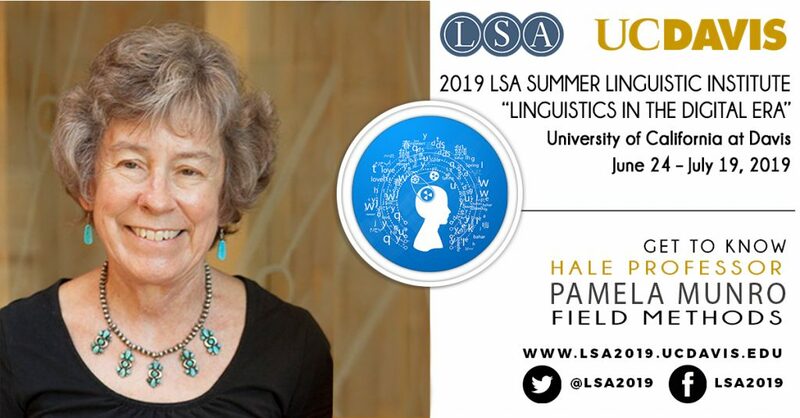 We are excited to announce that Hale Professor Pamela Munro from UCLA will be joining us at the 2019 institute. The professorship was established by LSA in 2003 to address the need for endangered language documentation in future Linguistic Institutes. I’m a Distinguished Research Professor at UCLA, where I started teaching in 1974 after receiving my Ph.D. in linguistics from UC San Diego. My research has concentrated on all aspects of the grammars of indigenous languages of the Americas, currently focusing on the Chickasaw (Muskogean; Oklahoma), Garifuna (Arawakan; Central America), Imbabura Quichua (Quechuan; Ecuador), Tongva (Uto-Aztecan; Los Angeles Basin), and Tlacolula Valley Zapotec (Zapotecan; Central Oaxaca, Mexico) languages. I have not been on the semester system since high school. I am a great fan of the quarter system. I am excited to learn more about Davis! I’ve only been there once, for just a few hours. Be open to things you haven’t thought about pursuing!